To make the pastry, put the flour, butter caster sugar and egg yolk into a food processor or blender and pulse until it reaches the consistency of breadcrumbs. Place 3 tablespoons of water in a cup and stir in the almond extract. With the motor running, add enough water, a little at a time, until the mixture just begins to form a dough. Roll out the dough on a lightly floured surface and line 4 x 12 cm (5 in) ceramic flan dishes. Prick the pastry all over with a fork and refrigerate until needed. Bake the pastry cases blind in the preheated oven for about 12-15 mins, until cooked and golden brown. To assemble the tarts, spread the conserve over the base of the pastry cases. Separate the eggs and mix together the egg yolks, mascarpone, sugar and ground almonds. Whisk the whites in a clean, dry bowl to stiff peaks and fold into mascarpone mixture. Pour this over the raspberry bases and top with the flaked almonds. Reduce the oven temperature to 180°c/350°f/Gas Mark 4 and bake the tarts for about 15-25 mins. The tarts are cooked when the tops have risen a little and the mixture is set and golden. 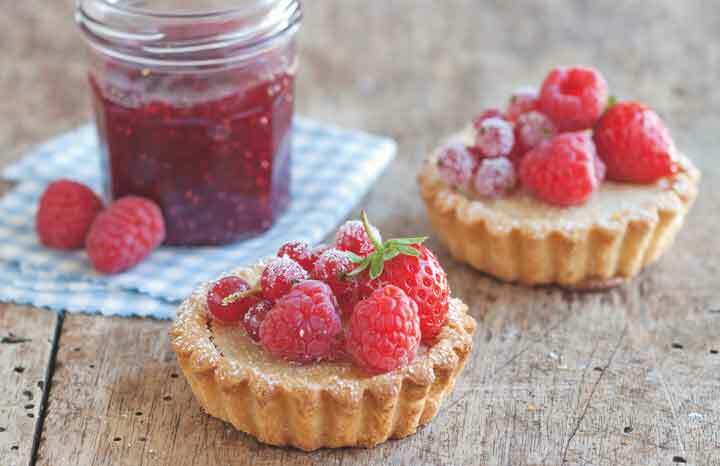 Lightly dust with icing sugar, top with fresh raspberries and serve warm, or cold with a dollop of crème fraîche.